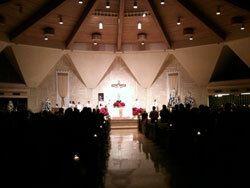 Although a blizzard was forecast, it didn’t happen here and we made it to midnight Mass at the Cathedral. It was a beautiful Mass and best way to celebrate the birthday of Jesus Christ that I know of. 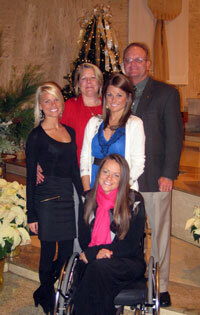 Of course family is also a very important part of Christmas and our daughters were home to go to Mass with us. After Mass we went up in front of the tabernacle for photos. Then it was home for unwrapping presents and a very early breakfast before taking a long nap. I’m pretty sure I’ll be taking another one today too. We all went on a great vacation this past week to Panama City Beach and on the way back visited my brother, Mark’s family. He and his wife have a beautiful baby boy we got to see for the first time. Of course we shot video and pictures like this clip of him with Carly’s iPhone. So, it’s a beautiful day in mid Missouri. The snow finally got here so we’ve got a white Christmas. Merry Christmas to you and your families.